I went into this with fairly low expectations. Even though a Terminator film had never completely let me down, with the weakest entry being Terminator 3, much of the early word on this wasn’t good. Add to this a trailer that seemed to show way too much … and I’ll admit I was nervous. Luckily then the final movie is anything but a let down. Kyle Reese (Jai Courtney), the hero of the original movie is shown being sent back in time to 1984 to protect a young Sarah Connor, a supposedly naive waitress who is about to be hunted by an unstoppable killing machine. But twist alert! When Kyle arrives in the past, Sarah is already prepped for his arrival, and has her own personal Terminator bodyguard. You see, a new timeline has replaced what went before, and now the battle to destroy Skynet once and for all begins anew as our heroes embark on a time travelling quest that takes them to an alternate 2017 where Skynet is known as Genisys, a Windows-like operating system on the brink of going on-line. I appreciated this new spin on the Terminator lore, and it worked brilliantly with respectful nods to the previous movies, whilst adding plenty of it’s own ideas. 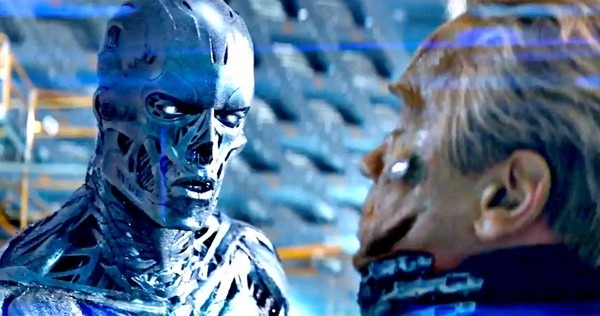 I loved getting to finally see the time machine used by Skynet to send the T-800 back, and nostalgia and some fan-service does this movie a real justice. The cast including Game Of Thrones’ Emilia Clarke, Die Hard 5’s Jai Courtney and Dawn of the Planet Of The Apes’ Jason Clarke all do a stellar job, and as a return to the franchise, ol’ Arnie is simply excellent – charismatic, funny and his aging status is well handled by the plot. 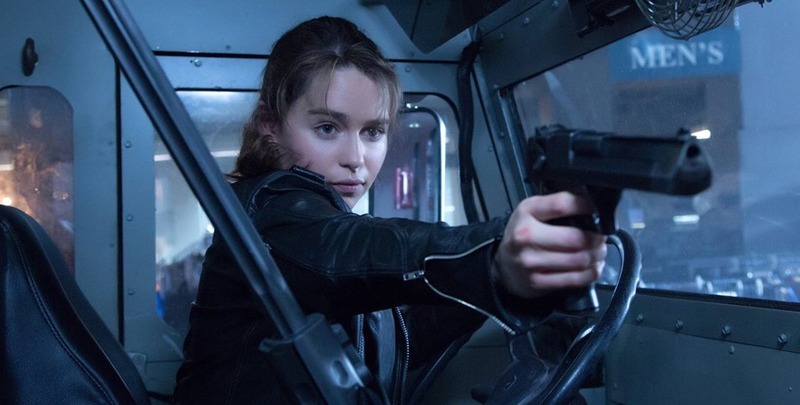 The action may not compare favourably with Terminator 2 (it gets a bit nuts) and the effects work, whilst decent lacks that ground-breaking edge – but regardless this movie was exciting, imaginative and a lot of fun.. Emilia Clarke is well cast as Sarah Connor, bestowing the character with just the right balance of vulnerability and ballsy attitude. I also welcomed a small appearance by J.K. Simmons. 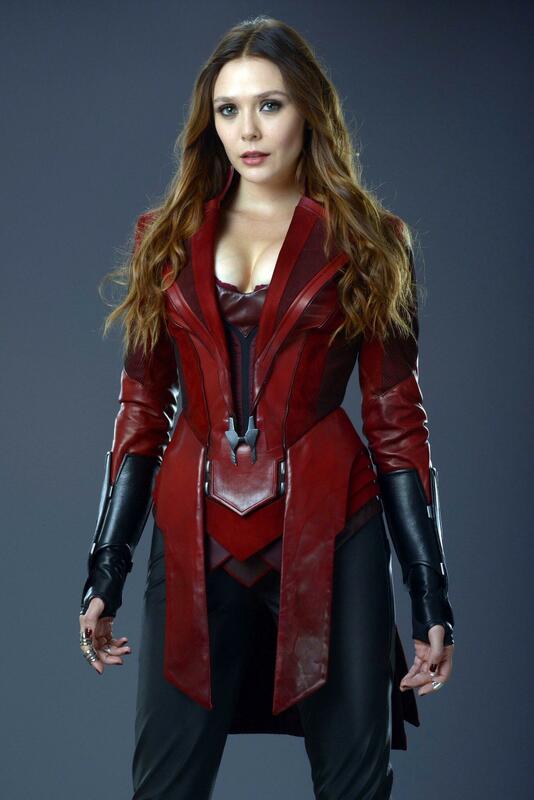 The new twists on the time-lines also breathed life into a starting-to-get-tired concept, and overall for me … this was the best movie in the franchise since T2. The last reboot of the fabled POTA saga was a refreshingly different take on the mythos, letting us in on a backstory that was only ever hinted at in the classic movie franchise. It was the Apes movie we as cinema goers deserved, further pushing from our minds Tim Burton’s earlier, ill-judged remake. This follow-up starts ten years after the events of the first, where we meet a group of surviving humans (lead by Gary Oldman), living in a tower in a destroyed and mostly abandoned San Francisco. The virus that spread at the end of ‘Rise has wiped out much of mankind all but for a few immune who hope to take back a world that seems to have left them for dead. Their only chance is to travel through the red forest to the Hoover Damn, where it’s power could reignite hope. Only problem is a tribe of scientifically-advanced apes, lead by Caesar (Andy Serkis) stand in their way and want nothing more to do with humans. Again this is a visual tour-de-force. The mostly CGI apes have become even more convincing (albeit for a couple of moments) and small little details in their expressions and varied personalities all help create characters that look and feel alive. Caesar this time has an adolescent son and a new born baby to worry about as well as growing tension amongst his tribe as humans begin to invade their territory … who does he side with and who does he trust? It’s a strong message and also a worryingly believable concept if our closest relatives were to suddenly ‘evolve’. Good support on the human-front comes from the recognisable but name-escaped-me at the time Jason Clarke (Lawless, Zero Dark Thirty) and also Oldman who regrettably didn’t go psycho bad-guy on us … but was decent regardless. But this clearly was about the apes, and for a movie to be so convincingly carried by CGI characters, despite the performances that exists underneath all the techno-wizardry, is a revelation – especially when at times it really affected me emotionally (Caesar’s relationship with his son ‘bright eyes’…). To back up the performances, we have several action sequences even if the movie lacks a rival to Rise’s Golden Gate Bridge stand-out scene – but this time around I found this more a character-piece, and we do get a great villain, whose identity I won’t spoil for you. It’s been said Andy Serkis, who also played Gollum in the Hobbit / Lord of the Rings, as Caesar really should nab himself an Oscar, and with such a layered and powerful turn, I can’t disagree. This was a brilliantly-conceived and intelligently put together sequel to a genuine surprise of a reboot … and I for one can’t wait for what comes next.